A freak last minute free-kick goal by David Turnbull earned Motherwell their sixth consecutive league win in Sunday lunchtime's live televised 2-1 success over Hearts at Fir Park, writes Craig Goldthorp. 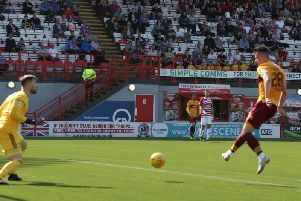 The Motherwell Times' live blog was following the action all the way as 'Well triumphed thanks to goals by Turnbull and young mate Jake Hastie. Look back on our blog to see how all the action unfolded.